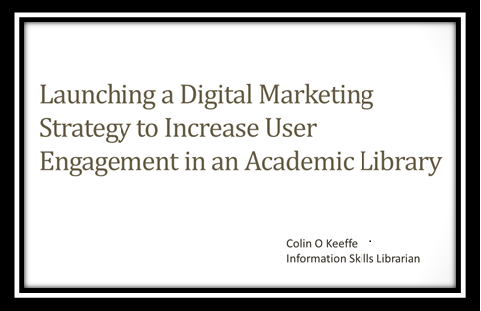 Colin recently put together a generic digital-marketing-strategy proposal for the academic library context and kindly agreed to share his work (see below). Effective digital marketing strategies empower library staff in their efforts to engage with, and maintain, an increasingly virtual library-user constituency. This is the age of the virtual customer. A silent virtual revolution has led to tumultuous and disruptive changes in environmental, financial, educational, and information environments. As the Library becomes increasingly virtual, it is becoming virtually invisible -- as are library customers. Libraries are redefining their roles, managing their migration from the print past to an online future in a time of spiralling costs and declining incomes, redefining their products and services and refocusing on their customers, many of whom they rarely if ever see. How do we position the Library in the marketplace? What is the message to be conveyed to a new generation of customers? What are the information needs to be met? What are the Library's products and services? What is the story to be told? How are the Library's products and services most effectively marketed? What communication strategies should be used to bridge the virtual and the real worlds? The paper explores ways in which the Library and its message can be "flipped". The promotion of goods and services that simplify client experiences is one direction. Less can be more. Ways of rebuilding relationships and establishing rapport with clients are presented. Possible approaches to the development of meaningful engaging content for particular audiences are outlined. Strategies in use by leading edge libraries are identified. Uses of social media in marketing and improving website content are obvious strategies. Designing product and promotional means for mobile devices is an essential component. Collaborating with others and using "influencers" and recommender services will enhance capacity. Ways of making the virtual library visible and telling the story effectively in a largely invisible domain are outlined and transformative strategies explored. Saw, G. g., & Schmidt, J. j. (2014). COMING OUT: MAKING THE VIRTUAL LIBRARY VISIBLE IN TODAY'S WORLD. IATUL Annual Conference Proceedings, (35), 1-9.